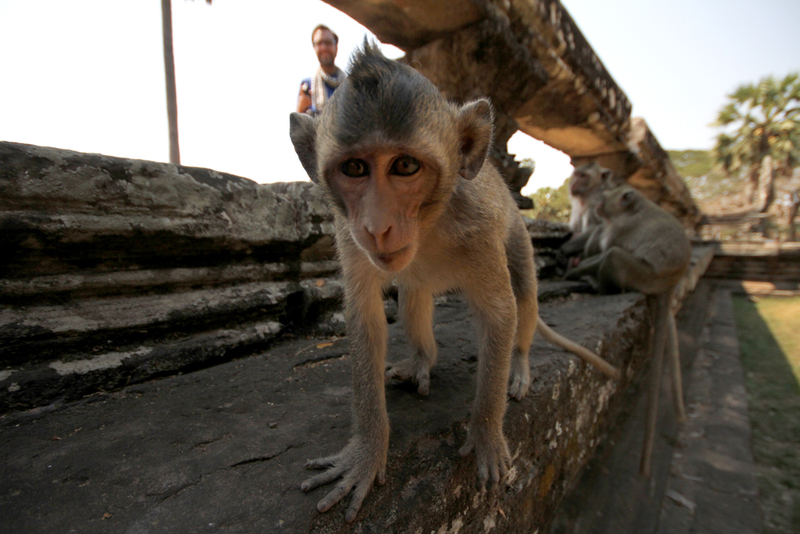 This monkey molested my video camera! 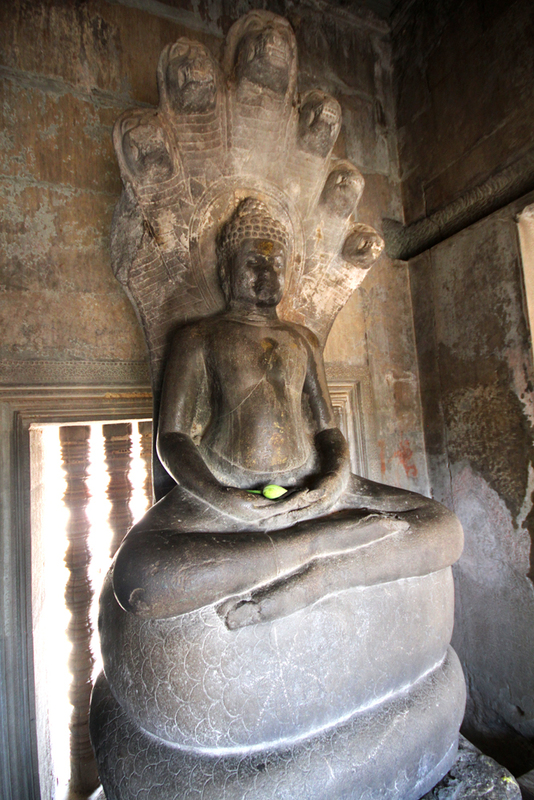 Buddha statue within Angkor Wat. 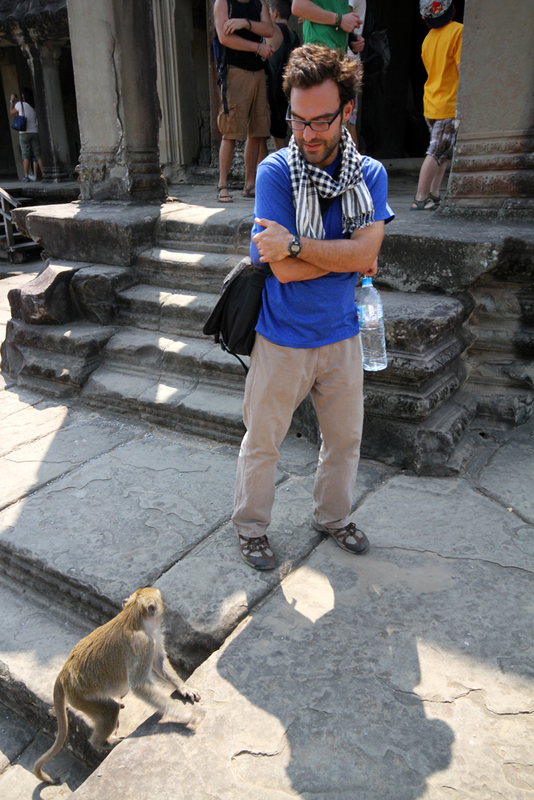 Monkey friend at Angkor Wat. 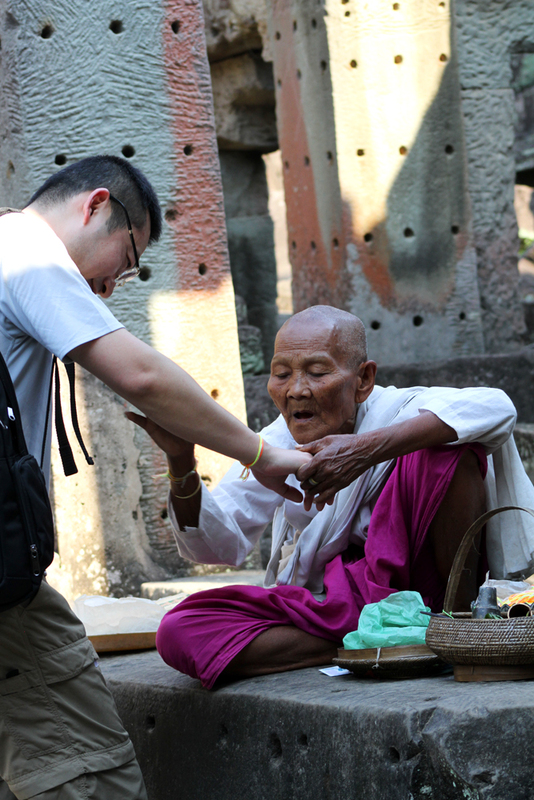 Him receives a blessing from a female monk. 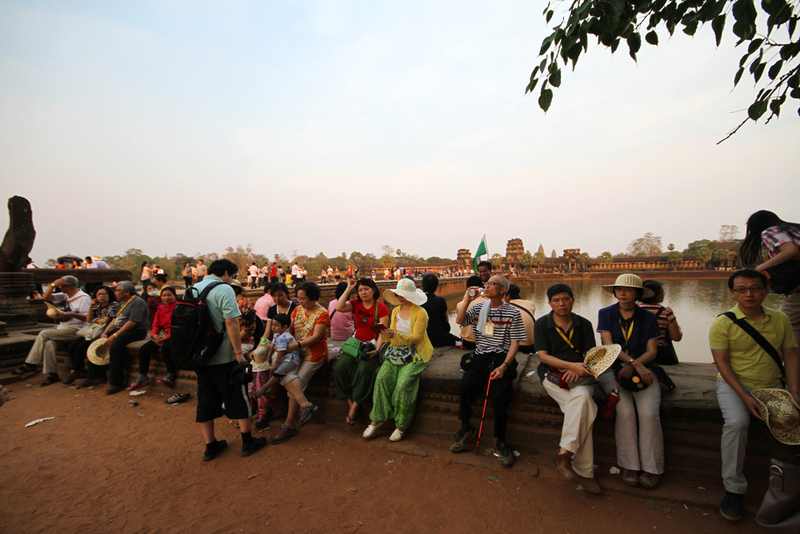 Part of the crowd gathered to photograph the sunrise over Angkor Wat. 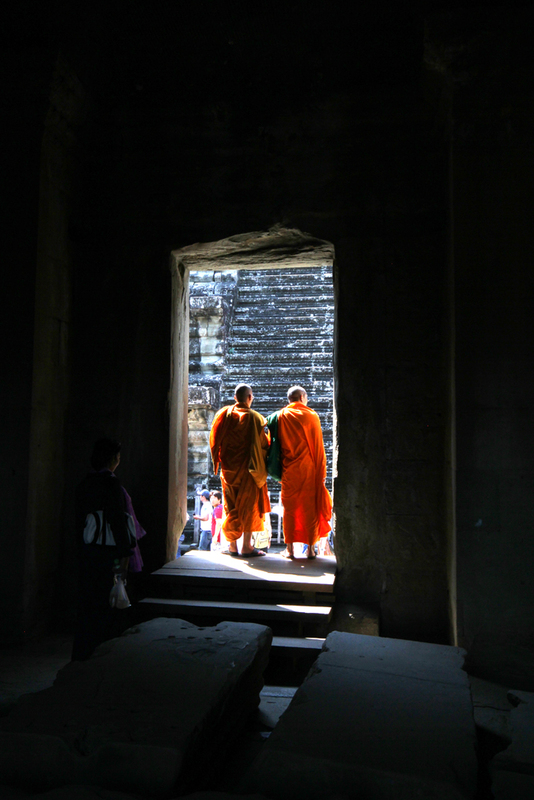 A female monk blesses a tourist. 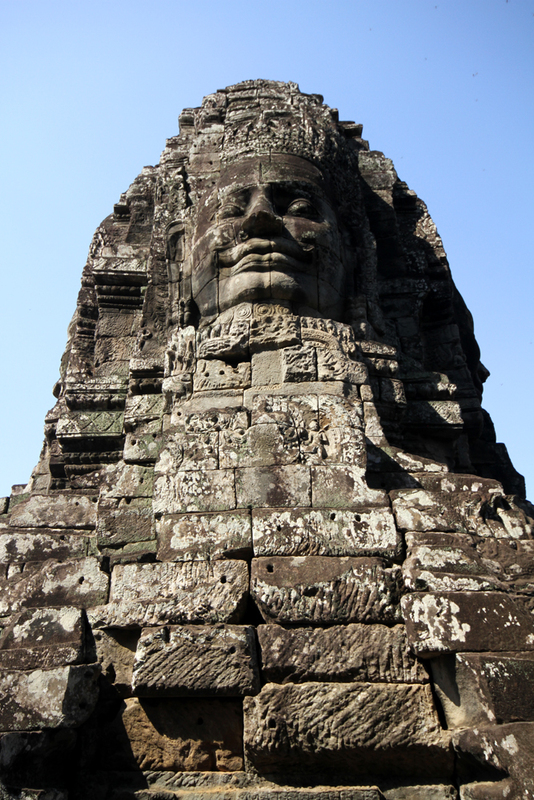 One of the "face-towers" of Bayon. 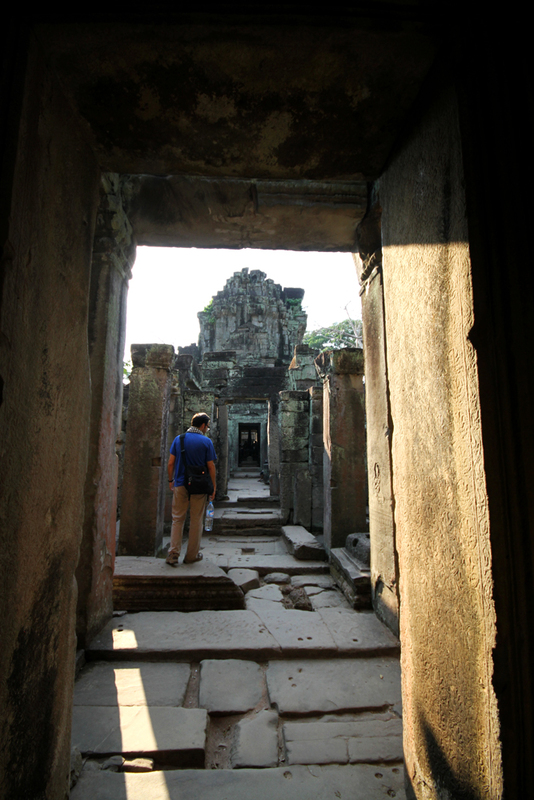 Him framed at Preah Khan. 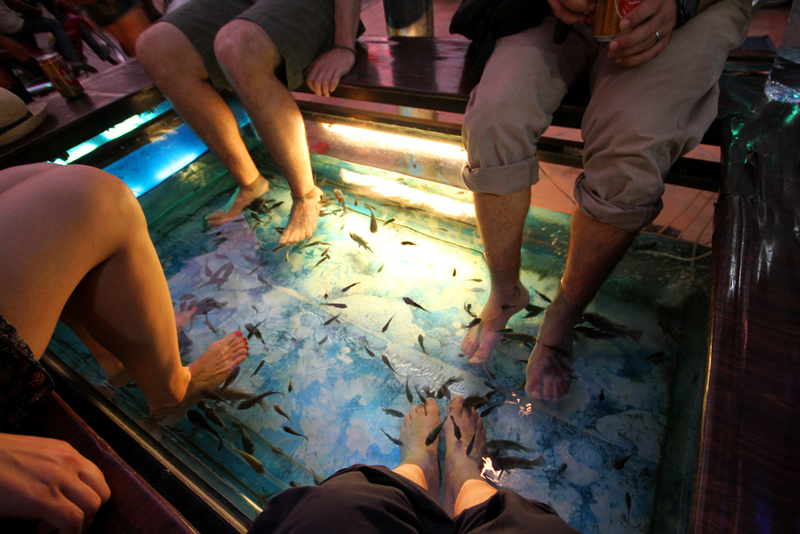 Him at the fish spa. 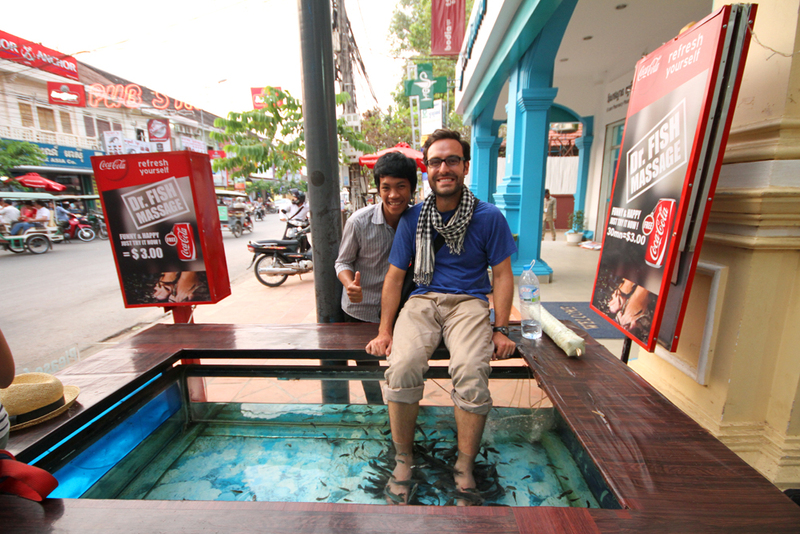 Soaking our feet in one of Siem Reap's ubiquitous fish "spas." 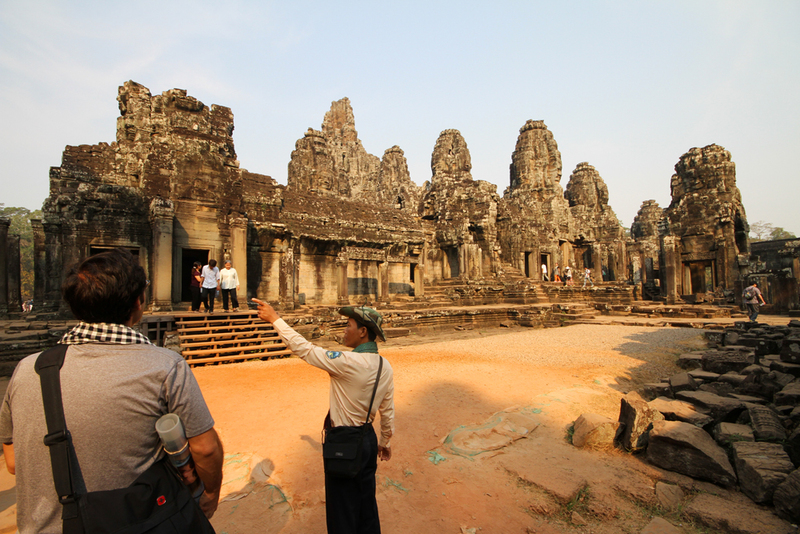 Our tour guide introduces the temple of Bayon. 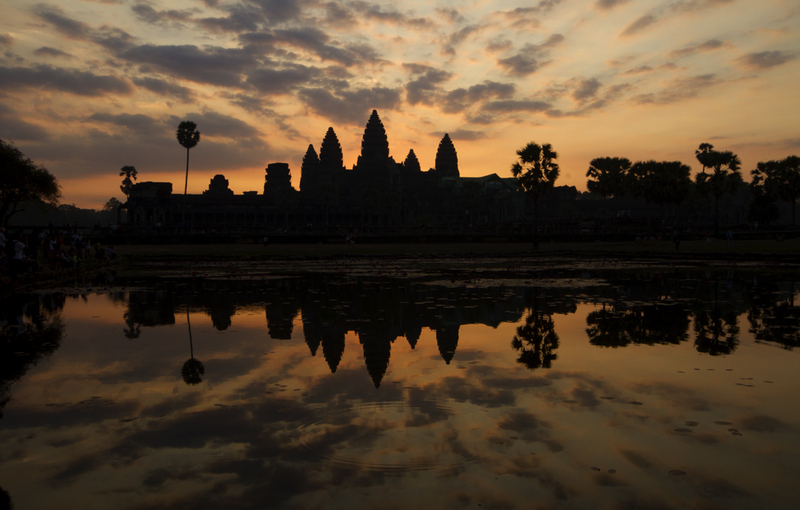 The name “Angkor,” tends to conjure up images of Angkor Wat, that massive, 200-hectacre Khmer temple and its lotus-like towers. 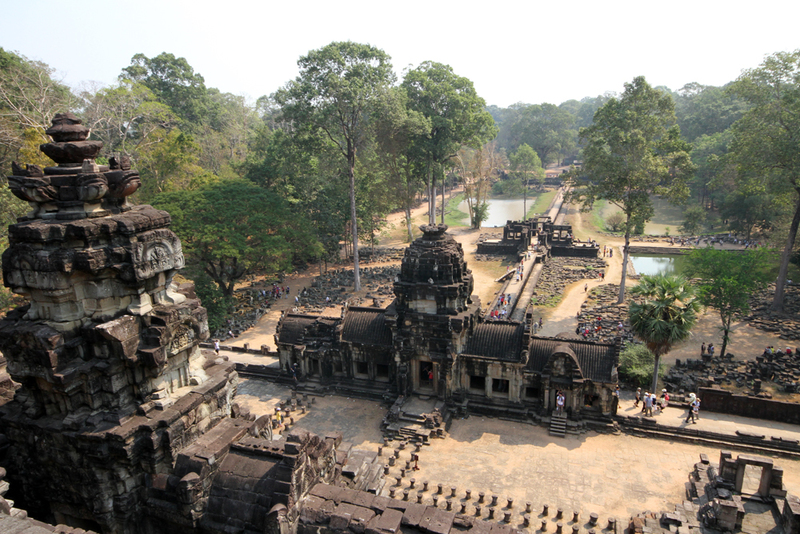 But Angkor Wat is just one of the scores of temples within the ancient city of Angkor. 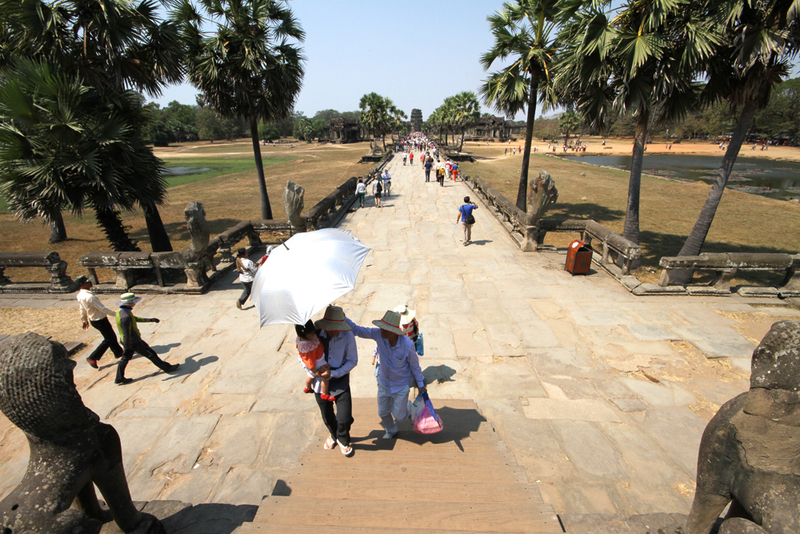 Angkor Archaeological Park passes are issued in one ($20), two ($40) or three-day ($60) increments to allow time to explore as much of this 400-square- kilometer World Heritage site as your gams can take. 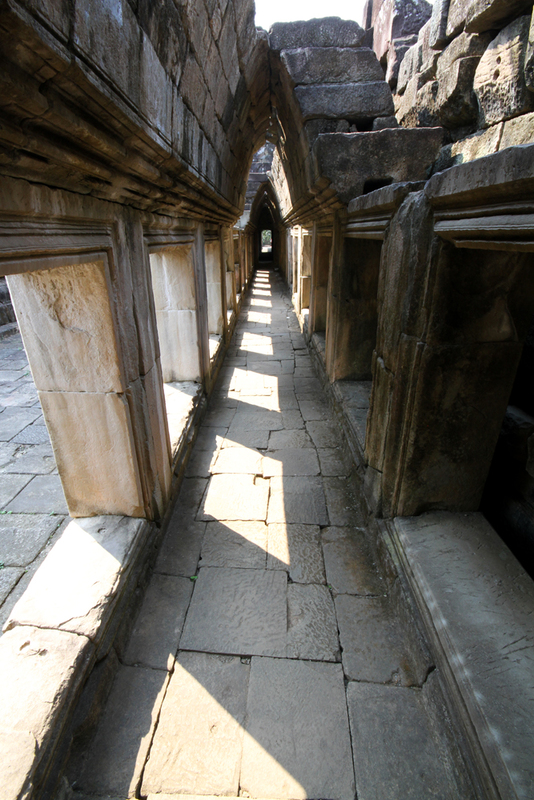 Even with a tuk-tuk ferrying you through the forest and farmland, from wat to wat, you’re up against a whole lot of walking. 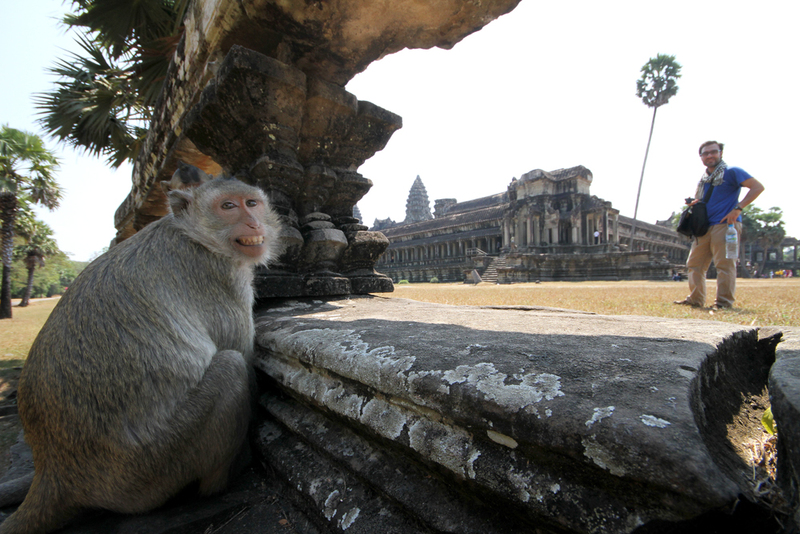 Following Him and I’s own three-day exploration of Angkor, we advocate hiring a tuk-tuk ($12-15 a day) but discourage against hiring a tour guide. Instead of a guide, pay a visit to Siem Reap’s Angkor National Museum ($12) for a primer on Buddhism, Hinduism and Angkor history and then purchase a copy of Michael Freeman and Claude Jacques’ definitive guide, “Ancient Angkor,” (available in Siem Reap bookstores for $5 or from wandering booksellers in the park for $7). 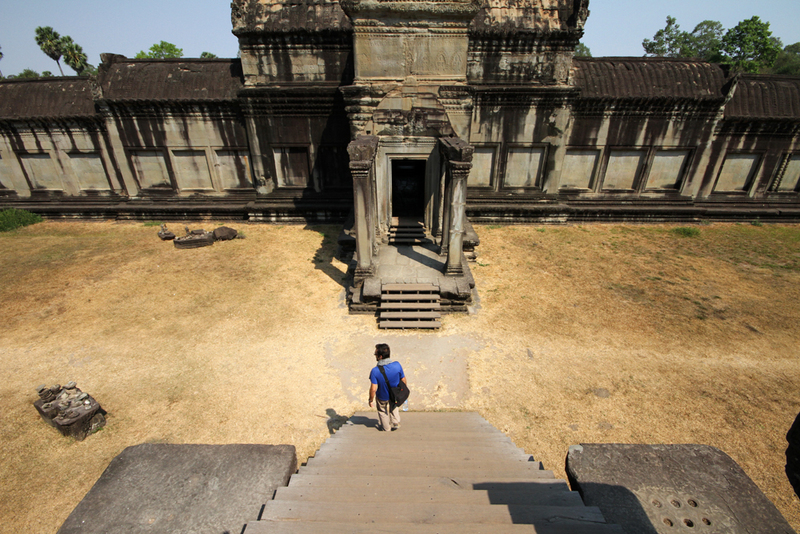 We spent hours in the museum and purchased “Ancient Angkor,” but only after making the mistake of hiring not one but two strongly accented guides we couldn’t understand. 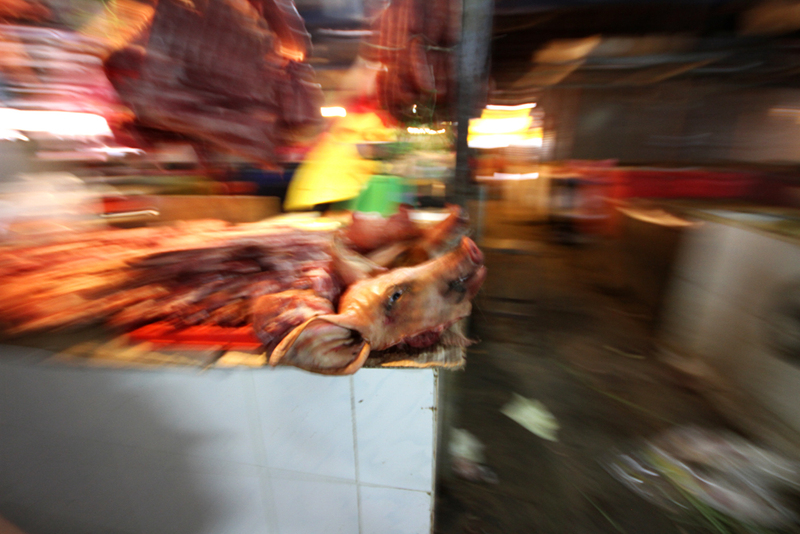 In addition to his thick Khmer accent, the second man was blessed with a speaking voice so soft we couldn’t even hear most of what we couldn’t decipher. 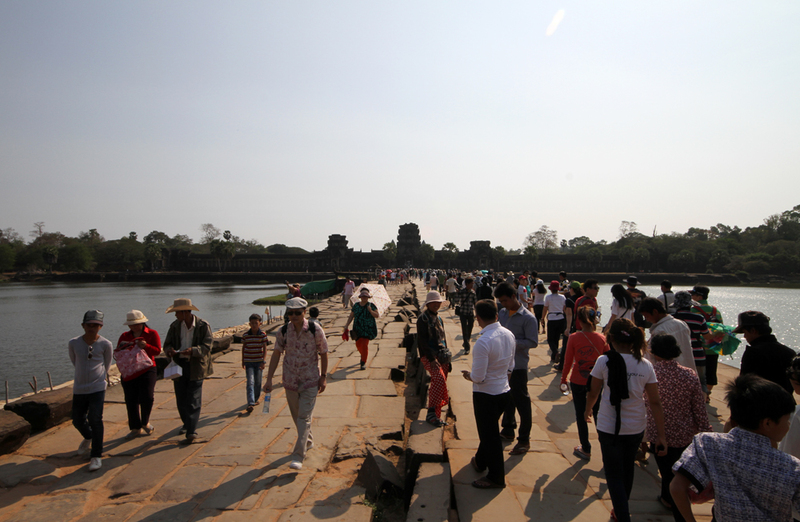 Our tuk-tuk driver deposited us at Angkor Wat’s main causeway into a swarm of touts jockeying for employment from a swarm of tourists. 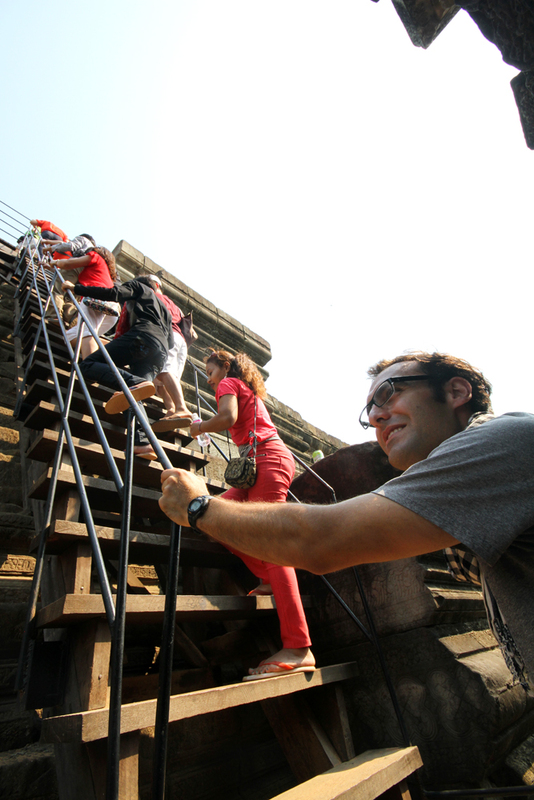 We didn’t want a guide, but Khoun was persistent and followed us the length of the bridge. He pitched $15. 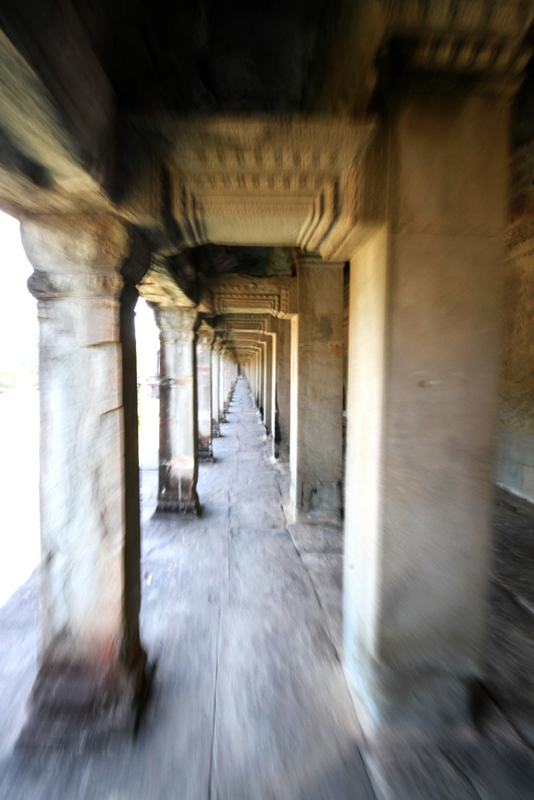 We bargained to $13, and followed him into the temple complex, entering through the “Royal Gate,” an apt choice due to Him and I’s exalted status, the tip-minded Khoun gushed. 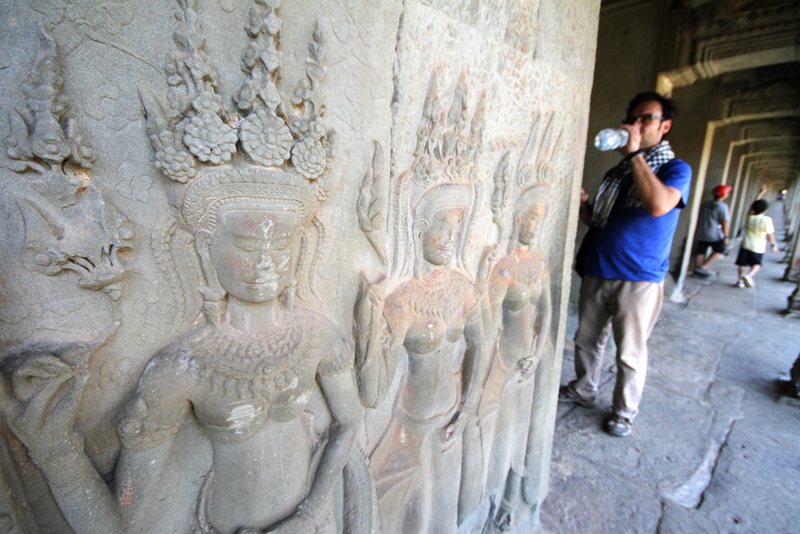 Our hour-long tour went something like this: Khoun recited facts in broken English and Him translated these facts to me – also in English – because I had no earthly idea what the man was saying. 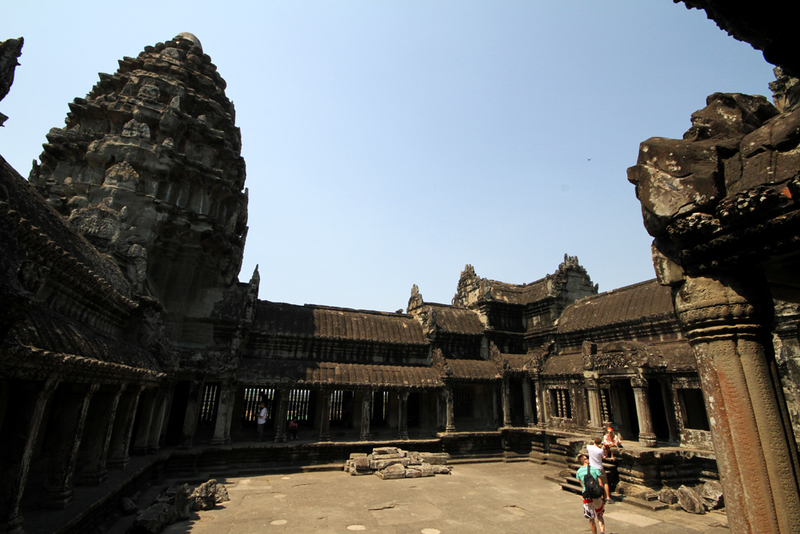 Through this method, I learned the Khmer constructed Angkor Wat in the early 12th century during the reign of Suryavarman II. 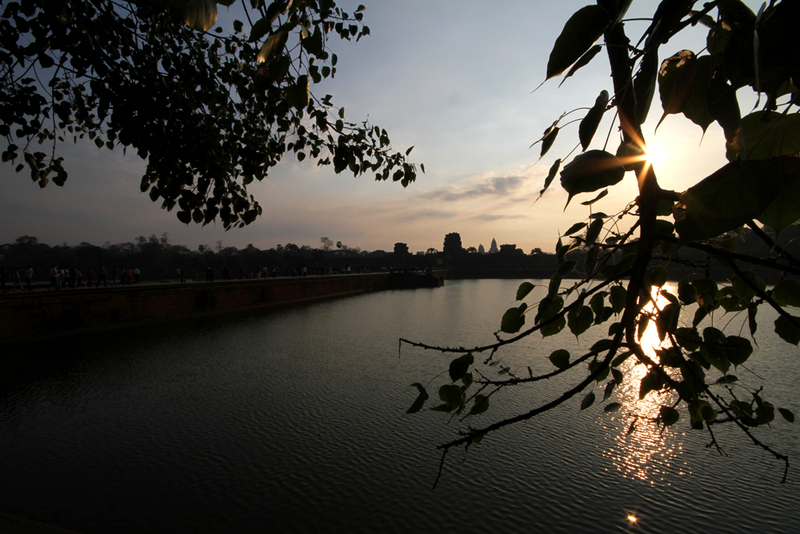 It was built as a Hindu temple, honoring Lord Vishnu, and symbolizes Mount Meru, home of the Hindu gods, with the wide moat representing the oceans and the towers representing the mountain peaks. 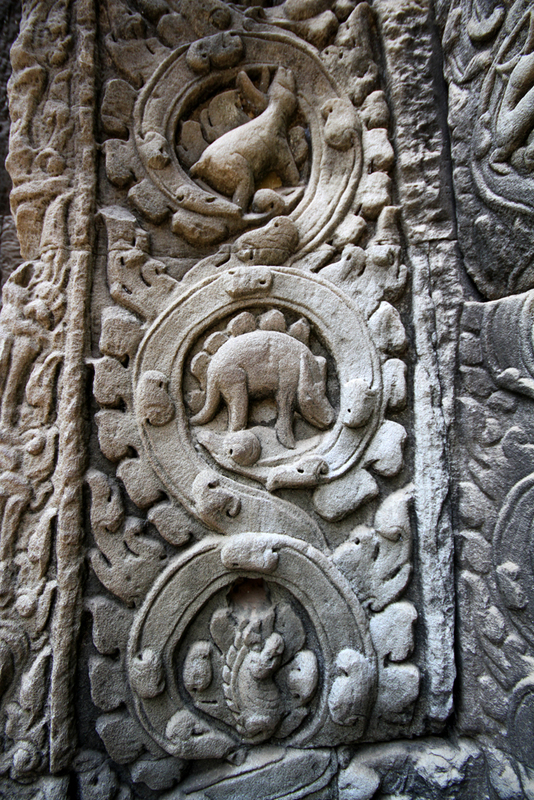 In addition to its unusual western orientation (East-facing temples are more common, but Vishnu is sometimes associated with the West), Angkor Wat is known for a 600-meter-long, 2-meter-high bas-relief. 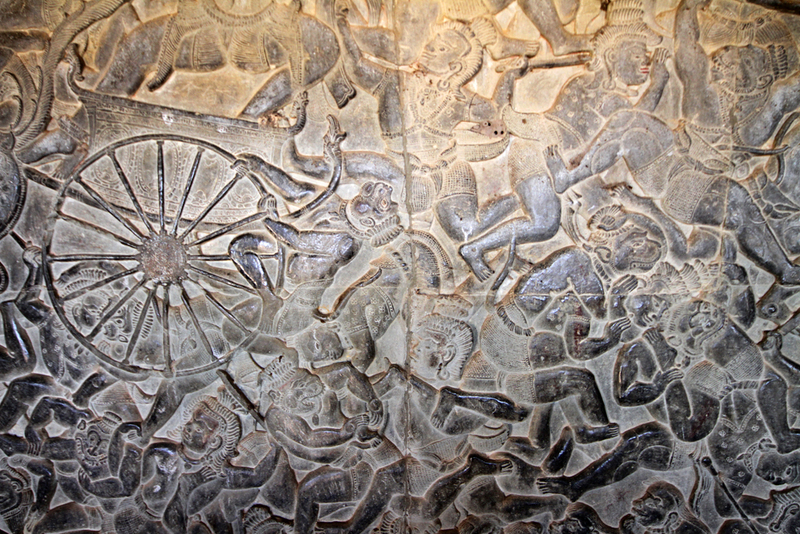 Every conceivable inch of this dizzying masterpiece is etched with carvings, a portion of which illustrate the Ramayana, a famous Hindu epic about the battle between King Rama (an avatar of Vishnu) and the demon king Ravana. 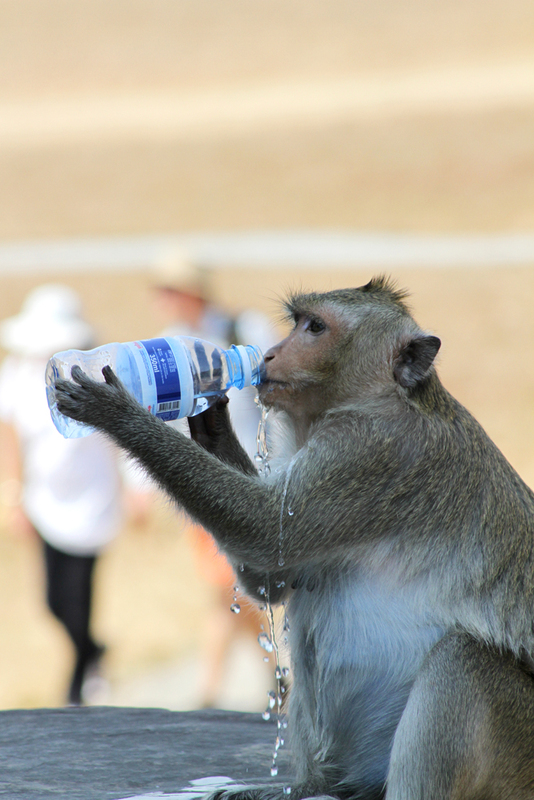 (This is a fascinating tale featuring such treats as a monkey army and a vulnerable belly-button, and I urge you to learn more). 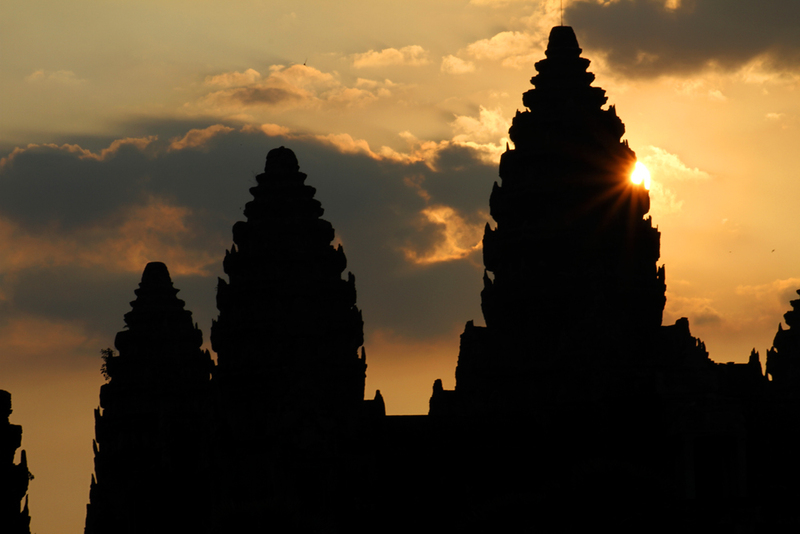 Angkor Wat may be the largest and most famous Angkor temple, but there’s a good chance you may enjoy the other temples just as much – if not more – simply due to the fact that Angkor Wat can be insanely crowded. 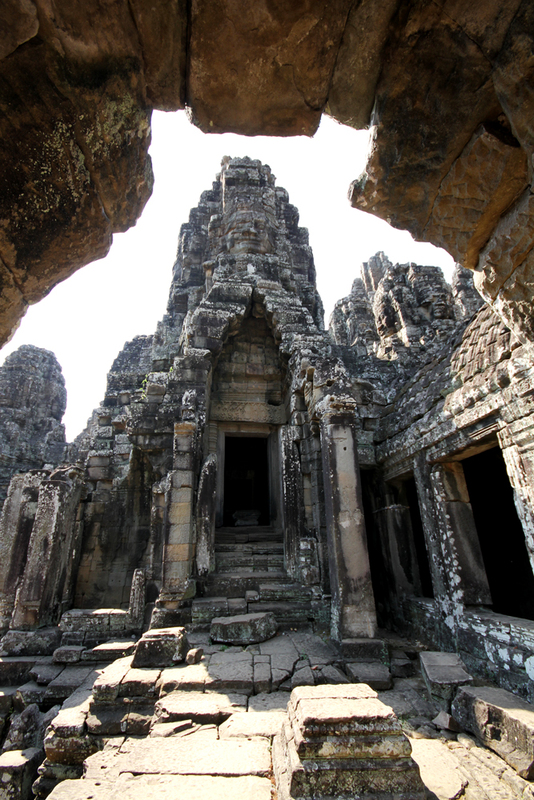 We visited our favorite temple, Bayon, in the company of the soft-spoken Yien (hired for the day for $25 through our hotel). 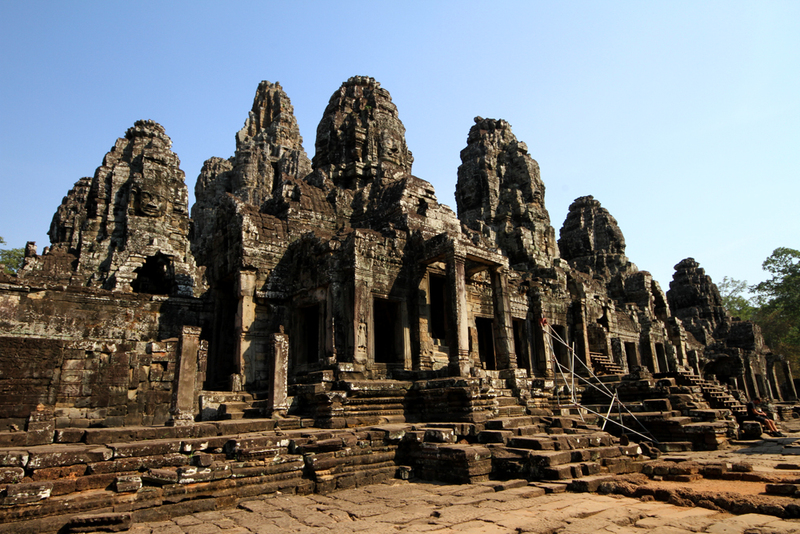 Yien introduced us to Bayon’s 37* face-towers, each one displaying a Jenga configuration of stones forming four imposing faces. 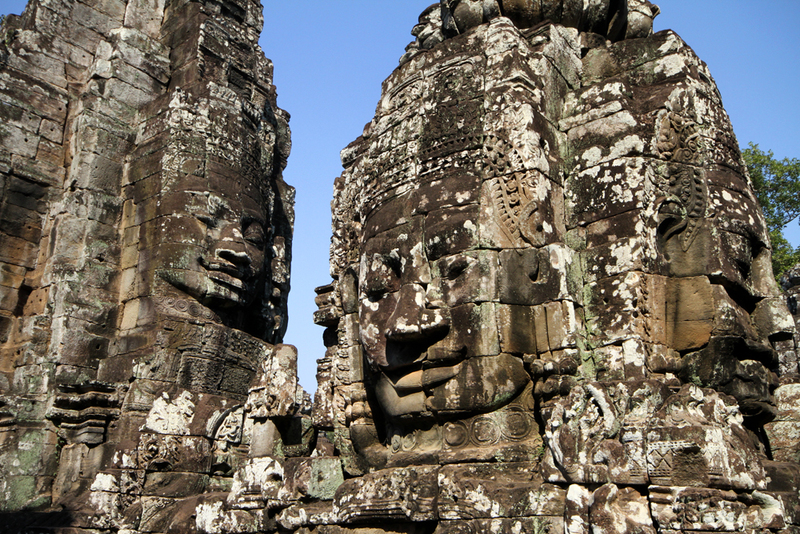 These faces may represent the Buddha or the greatest of Khmer kings, Jayavarman VII, during whose reign (1181–1220) the temple was built. 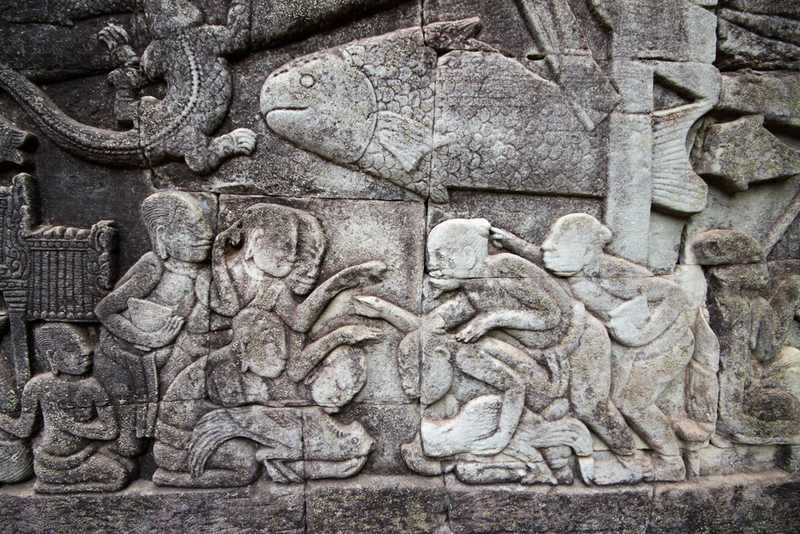 In addition to the face-towers, Bayon is unique for its two sets of bas-reliefs, one Hindu and depicting the activity of gods, the other Buddhist and depicting daily Khmer life at and around the temple. 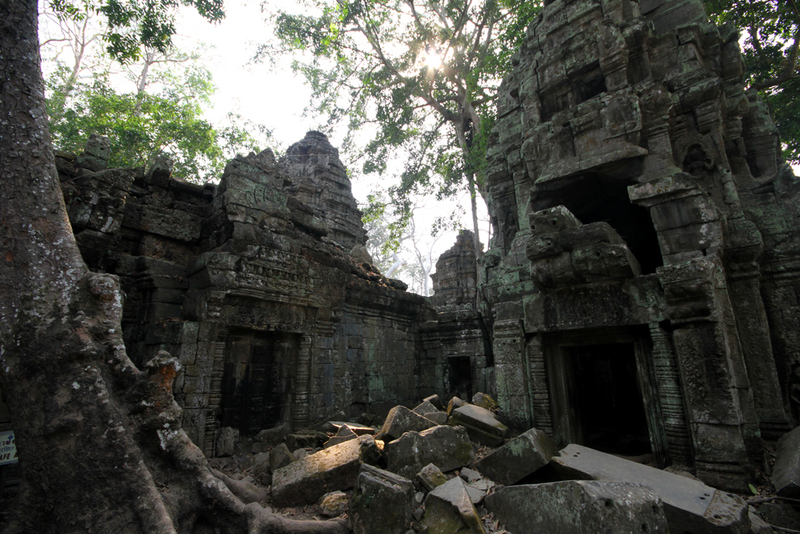 Jayavarman VII, considered the greatest of Khmer kings due to his building campaigns and incomparable expansion of the empire, also scores credit for Ta Prohm. 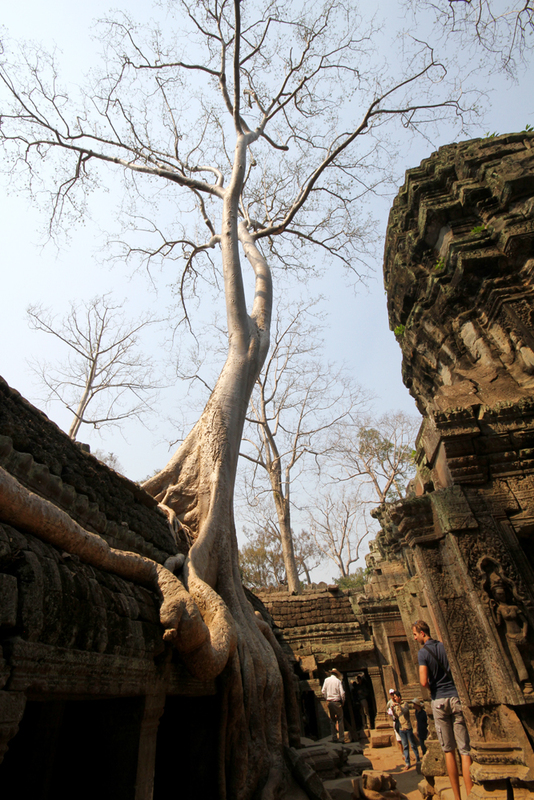 In addition to its majestic, invasive trees, the temple-monastery (AKA, “The Tomb Raider Temple”) is famous for that unfortunate Angelina Jolie film. 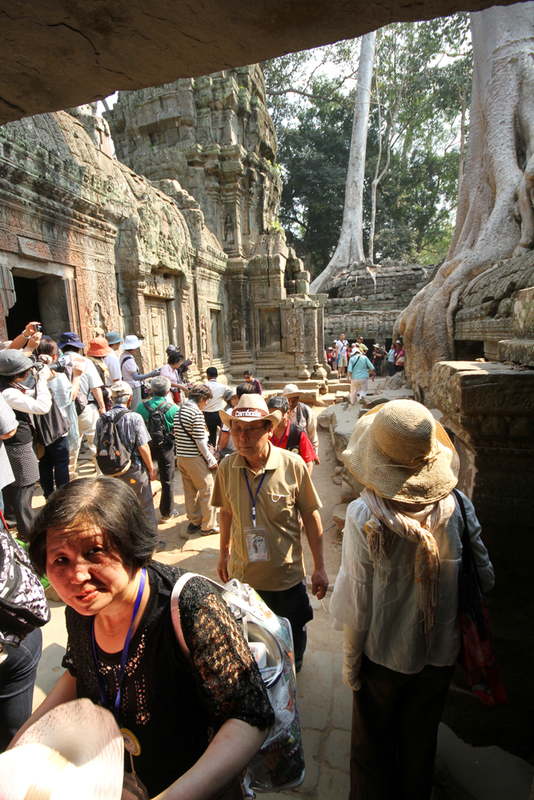 For me, Ta Prohm will always be remembered as the site where nearly every Chinese tourist in Asia managed to photo-bomb me. 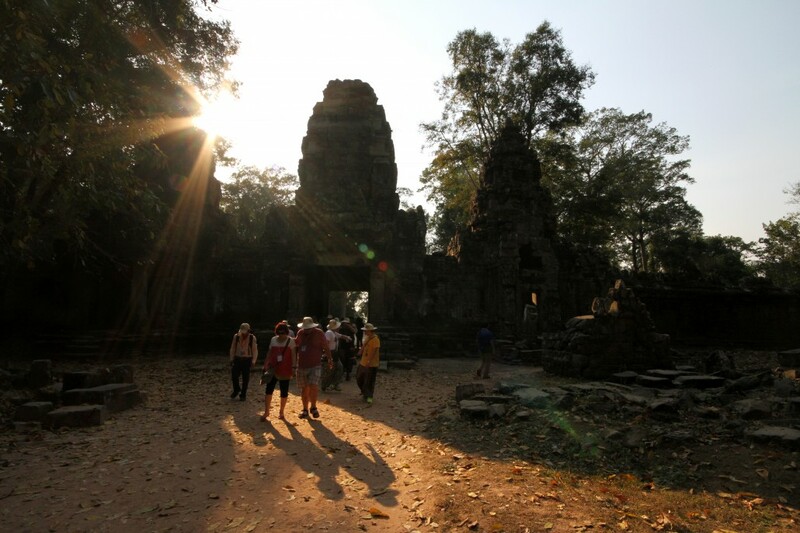 Our third and last day exploring Angkor consisted of waking at 4 a.m. to photograph the sunrise over Angkor Wat (a test of patience considering the hundreds of shutterbugs fighting for position at the reflective lily pond) followed by a 20km jaunt through the countryside to the temple of Banteay Srei and then a stop to the humble and humbling Cambodia Landmine Museum ($3), a not-for-profit that houses and educates young victims of the Khmer Rouge’s deadly regime. 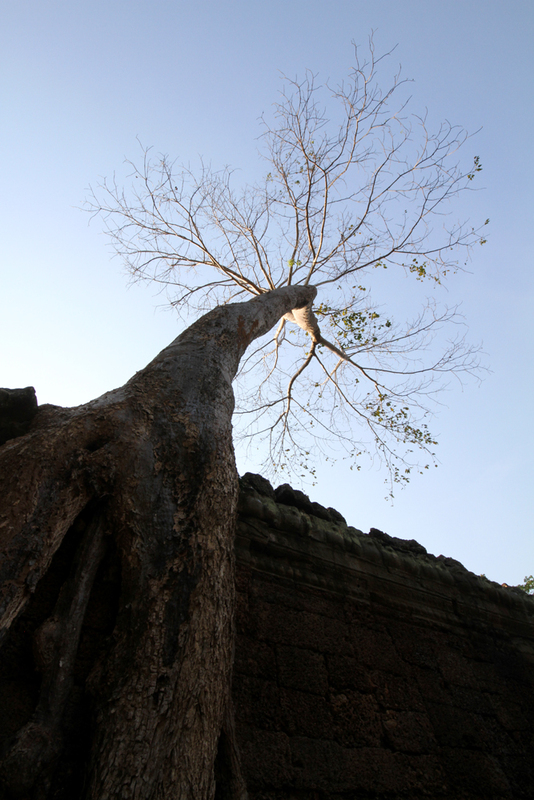 The charity was established in 1997 by Aki Ra, a former Khmer Rouge child soldier who now defuses and removes the bombs he once planted. 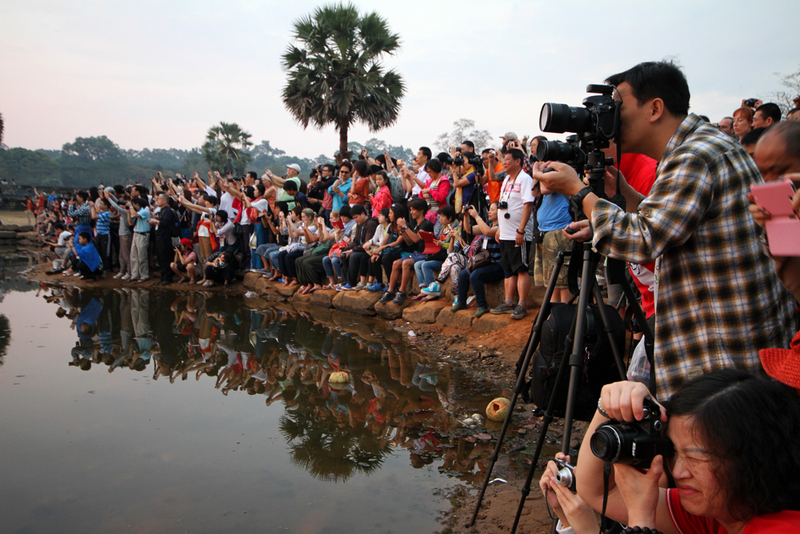 While countless defused landmines are on display, the children are not so as to avoid making them a spectacle. 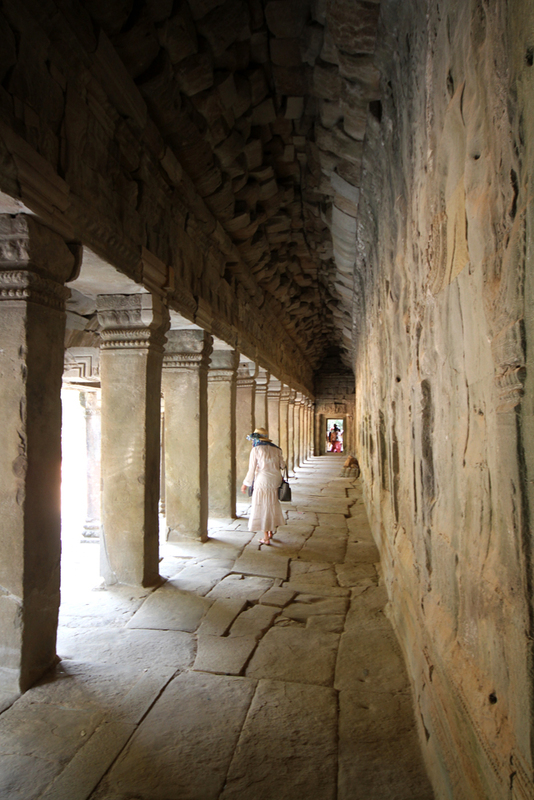 Day three of Angkor ended with Him and I catching the last half of “While You Were Sleeping” (with Khmer subtitles!) 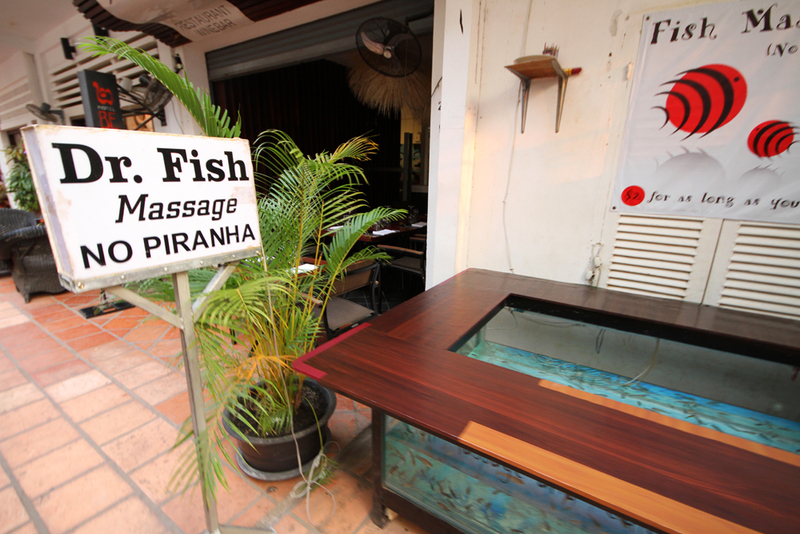 which put us to sleep at 4 p.m. Angkor had kicked our butts. I suppose you could say we had exceeded our maximum wat-age. 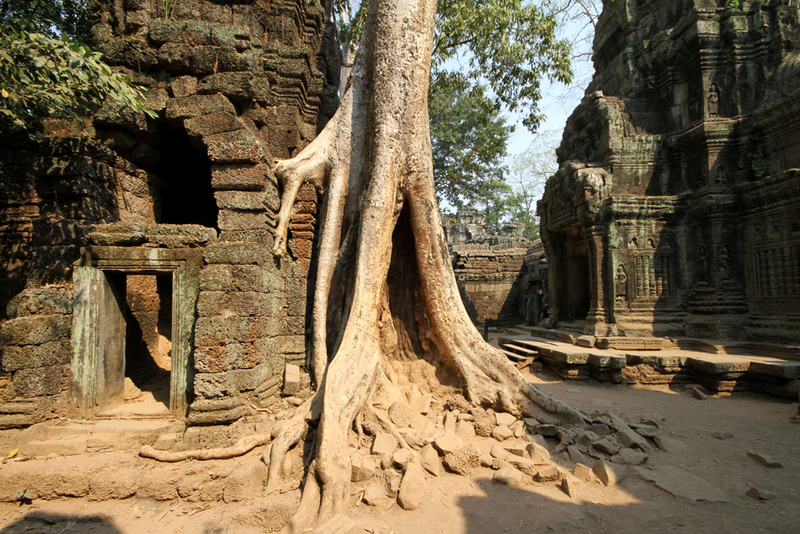 *Only 37 face-towers remain. 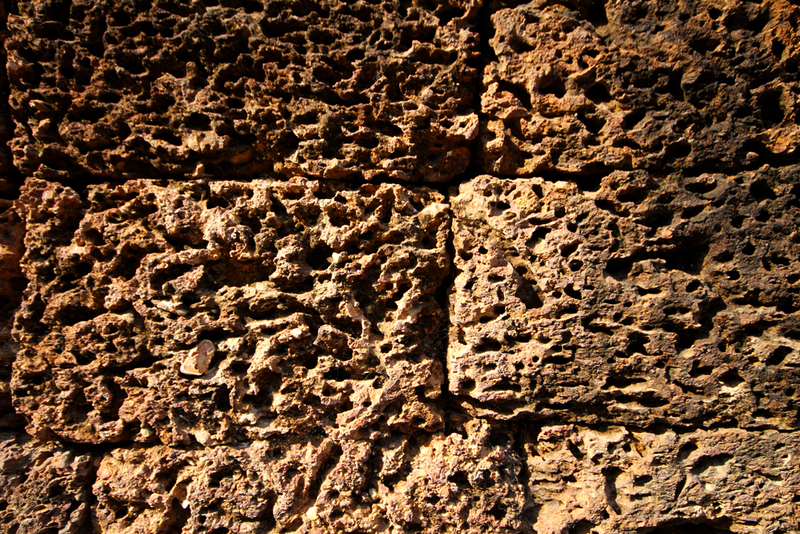 Archaeologists disagree whether there were 49 or 54 towers originally.